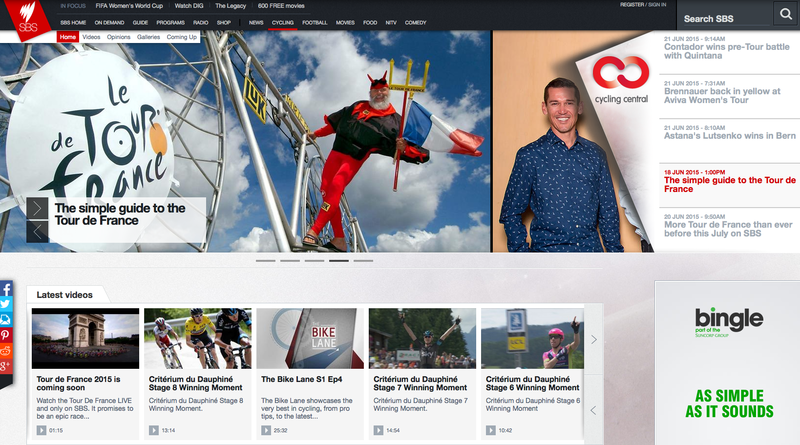 Television station, SBS, has introduced so many Australians to the Tour de France. What began with 6.00pm highlights in the nineties has become broadcasts of every stage live, repeat broadcasts during daylight hours, panel review shows, podcasts, online streaming and video highlights, audience interaction via social media and a dedicated website. The website pulls everything together in one place. It is a place to go to find video clips of interviews, stage highlights, previews, and several news and rider reaction stories as the race progresses. I joined the web team for a second time this year. It’s humbling to be involved in the production of news from the race, and a thrill to learn from such a dedicated multi-media team. I love seeing cycling covered in a newsroom environment, and learning about different tools that enable this type of coverage. The question most people asked me during July was ‘What do you actually do?’ What goes on behind websites is a bit of a mystery. We read them, but unless we work in those environments the nuts and bolts are a language all of their own. My job was to get up just after 4.00am each morning and head into the SBS Sydney office curate the morning news: weaving together stories, images, interviews, insights and highlights for people to read over breakfast and throughout the day. It’s a tight, talented and dedicated crew who put this coverage together. I worked most closely on the digital side of things with Kevin Eddy, Toby Forage, Madox Foster, Phil Gomes and Anthony Tan. Thanks guys. It’s a pleasure to work with and learn from you. And if you, the audience, are reading this, I hope you enjoyed the Tour immensely too. A couple of opinion pieces are below. These combine observations from the racing with research I have been doing into skilled action and expertise in the academic sector. What’s with racing through injury?